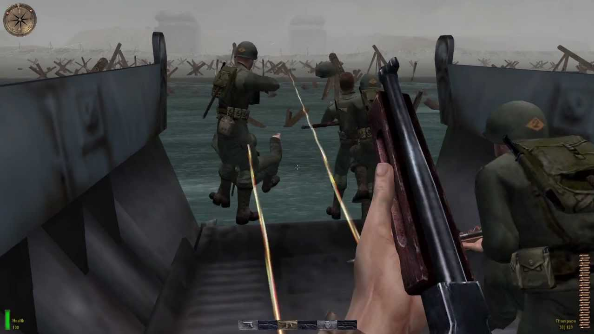 How realistically do PC games reflect the events of D-Day? June 6th, 1944. D-Day. 74 years ago today, the Allies launched Operation Overlord – the largest naval invasion the world has ever seen – in an attempt to grab a foothold in German-occupied France. The Allies did secure a massive victory. D-Day’s importance to the war has made it hugely famous. The beach landings are the most recognisable events of the period. Yet, despite being equal parts heroic and horrific, recreations of the events haven’t always stuck to the history books. Perhaps the most famous of these recreations is found in Saving Private Ryan. The film’s opening is heralded as being one of the most accurate depictions of the Normandy landings. Pretty much everything else falls behind that. Interested in how games portrayed this historical conflict? Try the best WW2 games on PC. For today’s lesson we will be focusing on how the events of D-Day went according to game developers. We’ll use the timelines from games that have become iconic for their D-Day reenactments, and point out where they went wrong along the way. Ready? Let’s go. The game: Call of Duty’s first mission sees you drop into France near Sainte-Mère-Église and work your way under cover of darkness to designated set-up points for your Eureka radar beacons. In this age of Michael Bay-influenced Call of Duty games, it’s easy to forget how quiet the original game’s opener was. Things soon heat up, though, as the rest of the 506th drop in and start clearing out houses in a whirlwind of machinegun fire and exploding AA guns. Before dawn, the skies have been freed and the village captured. The reality: Things kicked off slightly later than Call of Duty would lead you to believe, with Pathfinders hitting the ground almost an hour later at 0020hrs. Eureka radar beacons and marker lights were set up to guide in planes and paratroopers, but due to terrible weather the drop was almost a disaster, with troops landing all over Normandy and far from objectives. While Call of Duty fails to show the problems of the drop, the intense house-to-house fighting was seen by the 506th, who spent six hours battling the German 1058th Grenadier Regiment. The game: Call of Duty’s first British mission starts in a Horsa glider dropping the 2nd Ox & Bucks into France near Caen. The objective is to secure Pegasus Bridge over the Caen Canal, which will prevent German forces approaching the beach where Allied troops will be landing in just a few hours. Led by the apparently immortal Captain Price, your squad takes Pegasus bridge in just a few minutes, eliminating an exceptionally small defence. The Germans send a Panzer tank in, but you destroy it using a conveniently located German Flak88. The reality: The gliders carrying the 6th Airborne were the very first units in France as part of Operation Overlord, landing at 0014hrs, making Call of Duty’s British campaign pretty accurate. The bridge was guarded by just two pillboxes and a few trenches, which were overcome by 0021hrs. Later on, at 0200hrs, the bridge was counterattacked by the 989th Heavy Artillery Battalion. British troops destroyed the first incoming Panzer tank with their only PIAT rocket launcher (rather than the Flak88 as depicted in CoD), causing the tank’s ammunition to explode. The rest of the 989th quickly retreated. The game: Brothers in Arms opens with your plane being ripped to shreds by anti-aircraft fire. Falling way off target with your equipment bag lost, the first mission is a quiet, lonely few minutes spent creeping through the fields of France as you attempt to find your squad. With a few men pulled together, confusion is rife as no-one knows exactly where they’ve landed. Your squad soon finds some AA guns in the second mission and destroys them with TNT. The reality: Pathfinders may have set up Eureka beacons but the signal was so poor that they were almost useless. The heavy cloud cover complicated things, and the vast amount of AA fire filling the skies destroyed planes before the crew could even bail out. Brothers in Arms replicates this exceptionally accurately, and captures the confusion of troops as they had to readjust and regroup. The game: In Company of Heroes’ second mission you lead Fox Company as they regroup and destroy the AA installations hellbent on chewing up paratroopers. With the skies clear, Fox targets a key road that leads to Omaha Beach. A convoy from the German 91st Infantry Division is delivering munitions to the beachfront, but you ambush and destroy it as it passes through your captured zone. The reality: The 101st were the force behind Mission Albany, a mission to secure all the main roads that led to Omaha beach. As in Company of Heroes, the German 91st Infantry were located in the drop zone of the 101st, and took heavy losses during the fight to capture the route, including its divisional commander. The game: Allied Assault’s Omaha Beach landing mission sees Charlie Company hit the beach in the first wave. The landing craft opens far out to sea, requiring you to run through deep water before hitting the beach itself, and then sprint up the sands, all under heavy machinegun fire. Mortars strike the beach and medics frantically help the wounded. At the top of the beach, Bangalore torpedoes are used to destroy barbed wire defences, and troops storm the German bunkers. The reality: Before boats landed at Omaha, the navy and air force had bombed the area to take out German defences. Unfortunately, due to being cautious of hitting Allied landing craft, the bombers had dropped their bombs too far in-land, meaning the coastal defences were left standing and able to hose down the beaches with overlapping machinegun fire. Landing craft got stuck on sandbars 100 yards from the beach, forcing troops to wade through neck-deep water before they even made it to the beach. Tank support was due at Omaha, but they were deployed too far from the shore and sank. Half of Charlie Company was killed on the beach. Able Company, which landed at the same time, was almost totally annihilated. The game: Able Company hit Omaha Beach in the second wave and work their way up to the bunker defences of the Atlantic Wall under heavy machine gun fire. Bursting through the defences thanks to engineer demolition work, you lead Able through the breach and push the German defence back to a trio of Flak88 guns that are pouring fire onto the beach. Able Company destroy the guns, securing the beach for the Allies. The reality: Able Company actually hit the beach in the first wave at 0630hrs, and were almost entirely wiped out, suffering 120 casualties and left leaderless. Confused in the chaos, troops were left to hide behind whatever cover they could before the next wave arrived carrying Companies B, C, and D. Engineers arrived in the second wave to help blow open areas in the shingle for troops to gain entry through, but found it difficult due to loss of equipment, explosives prematurely exploding due to enemy fire, and troops being pinned down behind cover that needed to be blown. Not being able to move off the beach left the sands crowded, and further waves of troops were called off at 0830hrs due to lack of space. An evacuation was considered, but the 116th managed to work they way off the beach and destroy enemy fortifications by midday, allowing further landing craft to resume their deployments on the beach. The game: Dog Company hit the beach at Pointe du Hoc, a cliff face separating Omaha and Utah beaches, with the aim of seizing a battery of 155mm cannons that are emplaced there. Rope ladders are fired up the side of the cliffs and troops climb them under heavy fire. When reaching the top of the cliff you discover that the guns have been moved, so continue to fight inland with the hope of finding them. You eventually discover the guns hidden in a field and destroy them. With the objective fulfilled, Dog Company returns to the Pointe to mop up the remaining German defence and claim the cliff. The reality: 12 landing craft containing engineers and Companies D, E, and F were sent out to attack Pointe du Hoc, but only half of them arrived at the beach intact. The effective German defence and strong tides delayed their attack by 40 minutes. When at the top of the cliff, the Rangers were supposed to use flares to signal a second wave of soldiers to back them up, but because of the delay the assigned reinforcements were instead sent to Omaha Beach. Alone and with no reinforcements, the Rangers scaled the cliffs only to find the Germans had moved the guns that they were there to destroy. Allied command had known that the guns had been moved the previous month, but most of the Rangers were discovering this for the first time. Two small patrols were sent inland, and the six 115mm cannon were discovered and destroyed with thermite. For the rest of the day, the Rangers held the Pointe from counterattacks by the 914th Grenadier Regiment. By the end of the day, the 225+ strong Rangers force had been whittled down to a mere 90 men. The game: As part of 3rd Squad you make your way to the grounds of Brécourt Manor, where the Germans have an artillery installation which is currently shelling Utah beach. Working through the trench network dug through the grounds, your squad destroys all the guns and then proceed to assault the manor house. Against all odds the overwhelming German forces are eliminated, and the final gun emplacement in the manor’s courtyard destroyed. The reality: In one of the most game-like situations of the operation, Lt. Winters of the 506th (he of Band of Brothers fame) led 12 men against a battalion of 60 German soldiers who were defending the four howitzers at Brécourt Manor. Using the trenches as cover, Winters’ team managed to overcome startling odds and destroy every gun in the battery. During the assault, he was backed up by a second company, who aided in the destruction of the final gun. During the raid, the squad recovered a German map that was marked with every artillery and machinegun position in the area, which would become an invaluable piece of intel for the Allies. Winters lost just one man in the assault. The game: German forces launch a counterattack against the 2nd Ox & Bucks to reclaim Pegasus bridge. Despite the capture mission going smoothly, you have little more than rifles, Panzerfaust rocket launchers, and the emplaced Flak88 gun to hold off the incoming troops. You single-handedly destroy a battery of tanks, and manage to hold off the worst of the attack until the 7th Parachute Battalion arrive to offer assistance. The reality: The 7th Parachute Battalion actually reinforced the Ox & Bucks much earlier in the day. Together they defended the bridge from 21st Panzer Division. Reinforcements were expected from the 1st Commandos, who were due to land at Sword Beach during the naval invasion and make their way inland to the bridge by noon. Noon came and went, but no reinforcements arrive, and the 7th and Ox & Bucks continued to hold off the Germans. Thankfully, an hour later, the Commandos arrived, playing bagpipes, and helped to hold the bridge with the aid of a few tanks. Despite their frequent departures from the nitty gritty facts, the D-Day timeline is surprisingly well documented across games. Call of Duty’s bombastic gun battles don’t stray as far from the truth as you may think, and Company of Heroes’ checklist of strategy-staple objectives – with a bit of tweaking – could be actual Overlord documents. 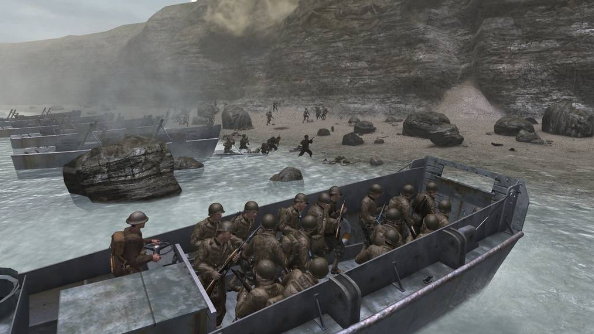 Brothers In Arms’ dedication to historical accuracy is not only represented in its events, but its locations are actually modelled on wartime-era maps of France. Its missions also go right up to 9pm, so it’s certainly the game to play for the authentic D-Day reenactor. So games may have their timelines a few minutes out, and there’s certainly way more ammunition lying around, and they’ll never truly capture the fear of that momentous day. But developers still clearly have enough respect for the soldiers to keep the in-game events near-enough accurate. All those times when you claimed you were playing Medal of Honor for a ‘history project’? Not such a bad lie after all.